In 1909, Maddy and Lou Emma Miller are newcomers to Gloriosa, Kansas, where their widower father, Professor Cyrus Miller, has just accepted a position at Eastern Kansas Classical College. The two sisters are used to doing many things for themselves, and they look forward to having a little bit of distance from their overbearing Aunt Jesse, and to doing all the family's housekeeping themselves. As they settle into their new home, Maddy and Lou Emma meet the locals: college president Dr. Biddle and his wife and son, Tommy, next-door neighbors the Wacker family, milliner Kate Turner, and troublemaking classmate Adelaide Moss. All of these figures become key players in the events of their first few months in Kansas, including braving the chiggers to pick berries, attending a Chatauqua and a speech by William Jennings Bryan, and helping their father to build the college's first telescope. I had a stack of family stories on the coffee table during this entire month, and only grabbed this one over a variety of others because it was illustrated by Joe and Beth Krush, whose work I have loved in Beverly Cleary's teen romances and in the Gone-Away Lake books. I knew from the first chapter, though, that the writing in this book is even better than the artwork, and that I had stumbled upon a new favorite. At the heart of the story is the two girls' warm relationship with their academic father, and the unorthodox way the three Millers relate to each other in the absence of the girls' deceased mother. 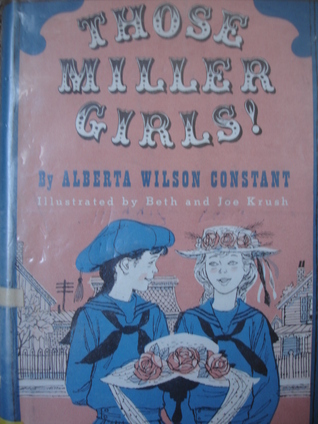 Because Professor Miller is such an intelligent and well-read person, the girls' dialogue with him is filled with allusions, Latin phrases, and plays on words, as well as inside jokes. Their family banter is delightful, and it really helps all three characters come to life. 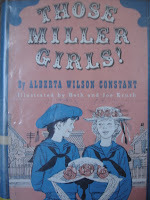 In addition to the dialogue, which is well-written for all the supporting characters as well as the Millers, the details of early 20th century living are also well-incorporated into the story. The Chatauqua gathering is described in great detail, giving readers who have never heard of such a thing a complete picture of what these events involved. The appearance of William Jennings Bryan and the girls' membership in a temperance group also help readers understand specific aspects of life in the early 1900s that might be missed by general history books. I also really enjoyed all the details of dress, especially the hats Miss Kate makes in her shop, and the outfits required for Maddy and Lou Emma for various functions.